This afternoon, at 1:26 p.m., spring officially arrived in Warrendale. That blessed moment of the Vernal Equinox. That moment when the robins begin to sing, grass begins to grow and politicians do stupid things. Okay - I'm pretty sure politicians do stupid stuff all the time. I just had to throw that one in there to make certain that everyone was paying attention. Anyway, this is what Warrendale looked like from my front lawn at the exact moment of spring's official arrival. 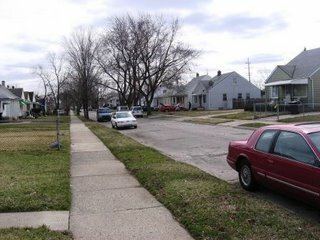 Welcome to Spring 2006, Detroiters. Development at the "Little Castle"?? ?